It’s been fifteen years since the day I spontaneously went with Shannon to DaVinci Tattoo in Wantagh. We weren’t planning on getting tattoos that day, but we did. I didn’t think I’d ever get one, but Shannon had paved the way by getting a shamrock on her ankle a year before. So it seemed less scary and foreign to walk in that day, to the place that sounded like a dentist’s office and felt full of possibility. That day, Shannon and I both got the Chinese symbol for “friend” on our back right shoulders. That evening, we met up with our Bible study friends to see “Blade” in the theaters, and spent the whole time going “Ouch!” whenever our backs touched the seats. That night, we had a sleepover in the same bed, and spent the night tossing and turning because our backs stung a lot. Don’t get too excited, readers at home – it was a big bed, and Shannon is my Sister. The next morning when I woke up, despite the fitful & stingy sleep, I had no regrets. Throughout the years, those tattoos kept us friends IMO, as well. I think we would have stayed friends regardless, but there’s something about knowing how dumb your tattoo will feel if you Break Up that forces you to work through the hard times. So basically, my one and only tattoo meant a lot to me. But I also really liked the sentiment of my co-worker Tommy, whom I met nine years after my tattoo. He was working on some very nice sleeves, and one day lamented how everyone seemed to want a story behind every tattoo. As he put it, some of his tats had stories, but he mostly saw tattoos as art. And why does one need to explain art? 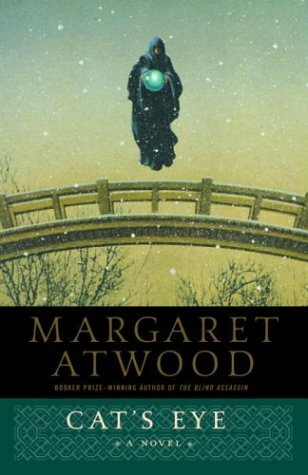 Back in 2007, I really wanted to get another tattoo, and nearly a decade later, I planned to take my born-again-maiden-tattoo voyage via Margaret Atwood’s Cat’s Eye. This book is one of my favorites of all-time. As with most things good in life, it was introduced to me by Sars from Tomato Nation. It’s a novel about how brutal even 10-year-old girls can be as bullies. In a pivotal scene, the protagonist gets ditched into a ravine in a snowstorm. Death is certain. But before she passes out, she has a vision of a black-cloaked Virgin Mary holding a cat’s eye marble. Next thing she knows, she’s not totally out of the figurative woods, but she’s out of the ravine, lying next to it. The cat’s eye marble in the book and on the cover is aqua/teal/turquoise. Back in ’07, my friend Marc was helping me design a gorgeous depiction of it, but then money got tight, and time ran away. 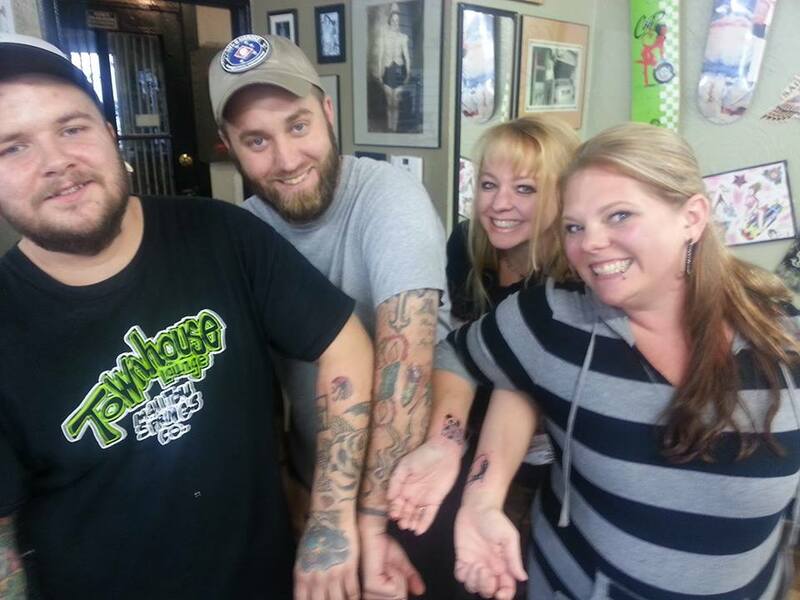 Here in 2013, my coworker and friend Jackie’s boyfriend was doing a Friday the 13th special at his shop where he is a tattoo artist. So long as your tattoo is smaller than a 50-cent piece, requires only one color, and has the number “13” in it, you can get it inked on you for only 13 dollars! My friends at work Ed and J.J. , who both literally don’t seem to know the number of tattoos they have, chomped at this bit, hurriedly requesting to be done at work by two that day. Whether they were just being polite or what I don’t know, but they invited me to join them. After 15 years of debating over what tattoo to get after my First Important Experience, it just felt right, to sign onto the adventure. I found a delicious irony(? I still never know) in the idea of having my long-awaited sophomore tattoo effort to my one and only super-meaningful tattoo, be vaguely meaningless. “Meaningless” is probably not the right word. But basically I liked the idea that I had to work within guidelines, and sport “13” on my body, in order to participate. I’d chosen a tattoo in my head the other night, while talking to Josh. I wanted a black cat. It would be to go with the Friday the 13th theme. It would be in honor of Scrubbins, and the Summer of the Kitties of 2013, and the friends I made that year. I would go with friends from Townhouse, to commemorate our time at Townhouse – a job I never saw coming, but has meant everything to me. And I could still get the sea-colored cat’s eye marble, only it would be literally in a cat’s eyes. There on my body, I could brand into me a symbol of hope. So even when it seems like bad luck is crossing my path at every turn, maybe it’s just a Joker or a Jigsaw, seeing how I will react to it. Jackie invited me to go outside when I was at the tattoo shop, and while I wavered among various tattoo ideas, it was pretty awesome to see a black cat with gorgeous mint-green eyes cross our path and come up for da pets and da rubs. And it was pretty awesome to see the people who fostered Scrubbins come up to us at Townhouse tonight, as they told us that both he and Sassy were doing very well in their adoptive homes. This has been a really special summer. And as I had no morning-after regrets after my first tattoo with Shannon, I have none for the black cat that now graces my left wrist. Both pictures speak two thousand words on my body. I kind of think I’d like at least a couple thousand more, before all is said and done. This entry was posted in Body Image, Books, Friends, Going Out, Miscellaneous, Women and tagged Bible study, Blade, Chinese symbol for friend, coworkers, DaVinci Tattoo Wantagh, Jigsaw, Joker, kitties, marbles, Margaret Atwood Cat's Eye, Scrubbins, Shannon, tattoos, Townhouse Lounge, Virgin Mary, Wantagh New York, Wesley Snipes. Bookmark the permalink. I think tattoo’s are addictive… Don’t you? I hardly ever see anyone with JUST ONE. Knowing my addictive personality I bet I would be covered with them if I ever got one.